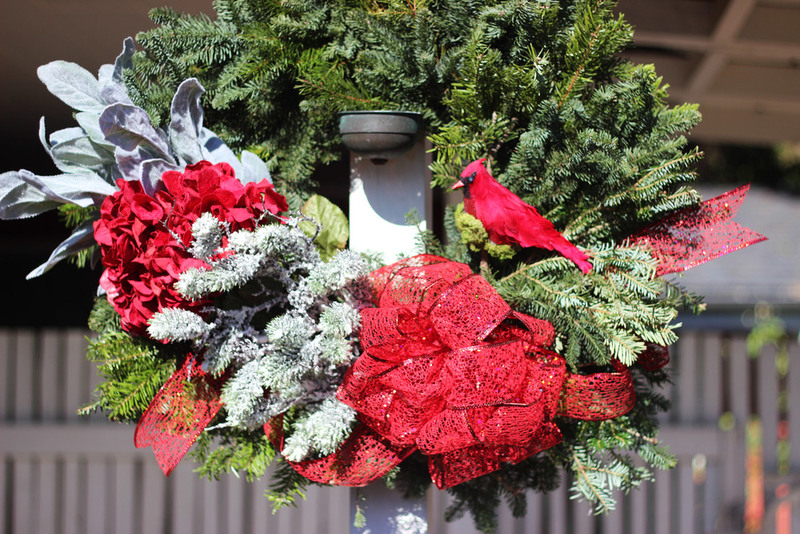 Making a fresh wreath is easy and fun. First buy your wire wreath frame and any ribbons, silk, and decorations that you will use. Next comes the fun part, you get to drive around and beg the guys that are freezing at the Christmas tree lots for tree cuttings. Collect some light green and some dark green cuttings. Since you can't be picky, you will have to go to a couple lots. You actually need a big armful, because when you cut them all to one size, you end up discarding some of the main stems. Now a word of warning, even though the 12 inch wire frame looks small, it will make up to a 26 inch wreath. That's BIG!!! Cut all your greens the same length. I cut mine 12 inches. I would suggest cutting them 6 inches or 9 inches. A 26 inch wreath is REALLY LARGE. Then you will use one continuous piece of wire to wire your greens on. 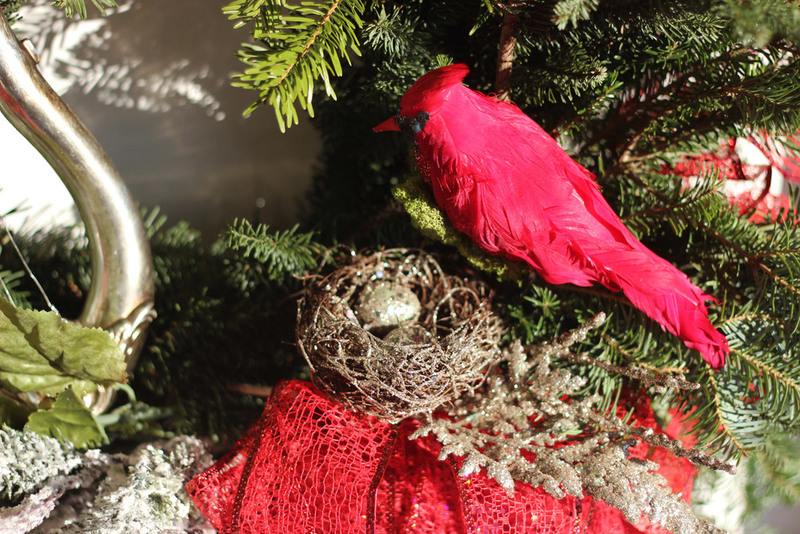 So, if you've purchased your decorations, and have made the rounds begging at the tree lots, you've done your homework and we're ready. Buy a 12 inch wire frame and you will use part of a paddle of 26 gauge wire. Select branches with different shapes, textures, and shades of greens. Secure the wire around the top. Wrap it around several times. Use one continuous wire to wrap all the green on with. Cut all branches the same length. I recommend 6 inches or 9 inches. Take a group of 2 or 3 and wrap the wire around the bottom 5 or 6 times. Add a group with a lighter color and wire it in place. Alternate with dark greens, then light. You are almost done. Complete the circle with greens then cut a little extra wire and secure the wire like you did in the beginning. Trim Dusty Miller. Position on bottom left and wire. Trim hydrangea with wire cutter. Position over Dusty Miller but 6 inches down, and wire. Wire on 'snowy' branch covering hydrangea stem. Find a 12 inch branch for a perch. Stick end of branch into styrofoam in bird. Find a heart shaped piece of moss about 3.5 inches long. See where moss will go under bird and put hot glue on that area. Make a loop to start your bow. Then make a larger loop about 4.5 inches out. As you bring ribbon back, fold and twist at center then make similar loop on other side, folding and twisting at center. When you have 5 loops on each side, make long loop(for tails). Wrap wire around the center. Pull wire tight to back also including the end of the last loop, and twist. Cut bottom on long loop for tails. Use fingers to fluff out ribbon. 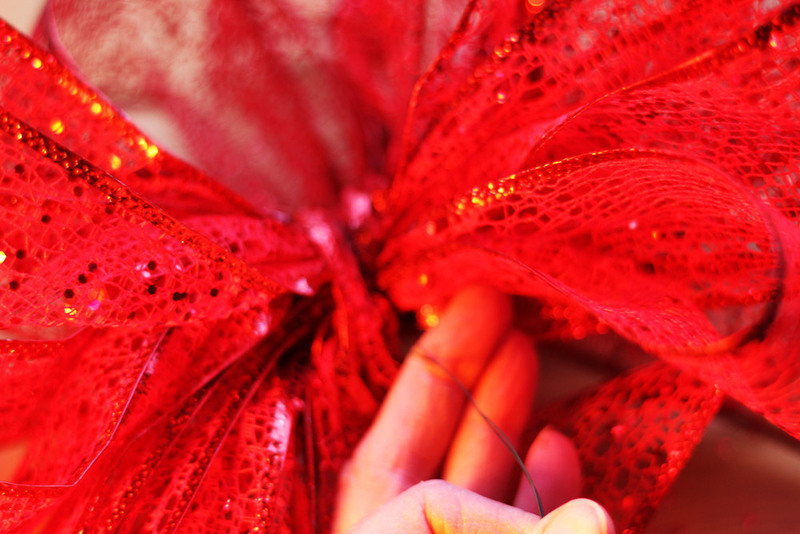 Pull ribbon loops into shape to make a bow. Use wire to secure on wreath. Attach bow with wire. Twist wire in back of wreath. You're almost done, but this bird needs a nest! Ah, here's a beautiful silvery nest with two eggs for the bird to watch. Attach the nest. "Hmmm...I tought I taw a tweetie boyd," says Dobie. "Well can I eat him? Can I eat him?" "No....did you say No?" Well thanks, Dobie and Buddy. And now you are done with this winter wreath.